Teeth veneers look great and feel just like natural teeth and so are very aesthetic looking. They can be made either from composite or top grade porcelain material. So by barely altering a single tooth you can get back your amazing smile in no time ! So when you go for your veneers treatment to your dentist they would shape your teeth in the dental chair and then take an impression mould which will then be sent to the lab to create a model of your mouth. This would then be used to make veneers and how the final result would look like and fit giving you a new smile. Once veneers are fitted all you need to go is normal care including brushing and flossing, visit us every 6 months for a checkup and clean. 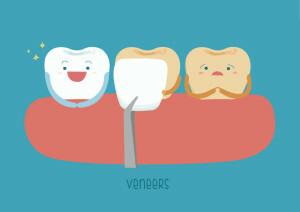 With right care the veneers can last for 10 years and in some cases even 20 years. So what are you waiting for ? Call our London Dentist to get your celebrity smile today !